When Flying Colors released their debut album back in 2012, my first thought was that it was just another progressive side project from drummer Mike Portnoy (Dream Theater, Transatlantic, Adrenaline Mob, Avenged Sevenfold, The Winery Dogs), playing 25-minute songs. Now I might be into some prog like Dream Theater, Opeth, Bigelf and Shadow Gallery, but most of it really makes me wanna go to sleep. Also, the fact that this band included keyboard player / singer Neal Morse (Spock’s Beard, Transatlantic) and ex-Dixie Dregs bass player Dave LaRue made me convinced that this band was nothing for me. Lead singer Casey McPherson hails from a band called Alpha Rev, a name that means nothing at all to me as I have never heard a note by them, but there was one name that made me at least a little interested: Steve Morse. Now, Steve Morse is the guitar player for Deep Purple since 1994 when he replaced Ritchie Blackmore and plays on brilliant albums like his 1994 Purple debut Purpendicular and their latest killer Now What (2013). He was also a member of both rock fusion band Dixie Dregs and Kansas. I thought, maybe I should at least give this band the benefit of a doubt – or something. And so I did. What I got was a magnificent journey through the minds of a bunch of progressive rockers who wanted to do something more melodic and straight forward than their day jobs. But that doesn’t mean that the album was short of progressive moments, no, there were such, of course. You really can’t bring in musicians like this and not get prog elements, but what was in focus on that record was the songs, the melodies, the groove and not how much and fast and technically hard the musicians could play. The album completely floored me right from hello and I haven’t stopped listening to it since. One of the best albums of 2012, no doubt. Next question: Was this just a one-off? Was this just an album they made for fun, never to be visited again or would they tour it and maybe write another one? Luckily for us, they decided on that Flying Colors wasn’t just a side project, but an actual band and only two years later, this bunch of busy musicians has not only written the songs, but actually recorded and released their second effort Second Nature. Now their self titled debut was one of the rare 10/10 reviews so the next question was, how on earth would they be able to top that record? Or even make one equally as good? Well, read on and I will tell you all about it. 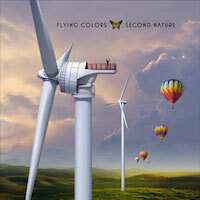 The first thing that happens, of course because of me talking about Flying Colors aren’t as proggy as other prog projects, is that they open this album the way they ended their debut, with a 12,5 minute long prog song – “Open Up Your Eyes” – that is style wise equivalent to all the members’ day jobs. A grandiose piece of work, but it never gets boring or annoying, it’s just plain great. Next runner-up is first single “Mask Machine”, an odd choice for a first single and to be honest, the first time I heard it, it left me somewhat cold. I thought the song sounded unfinished and kind of cavernous, but I had a change of mind already by second listen. I now find it brilliant and the Bigelf meets Muse with some distorted, progressive guitars on top, is just stupendous. “Bombs Away” is a heavy piece with a 70’s groove, but the melodies almost goes AOR – this is really awesome stuff and very invigorating. “The Fury Of My Love” comes really close to being a power ballad and it could actually be an AOR-hit. But as always when music is played by un-mawkish musicians, the result is never cheesy. It’s just a damn great ballad. So when you’ve gone and done an AOR-ish ballad, why don’t all the way and write a pop metal hit song? Said and done, “A Place In Your World” is that song and it is a fantastic tune. I might have to add that it sounds like a Flying Colors tune all the way. “Lost Without You” is a heartfelt, grand ballad that gives me goose bumps every time I listen to it. “One Love Forever” really shows that this band has a “the sky is the limit” – attitude towards the music – no rules allowed. It has a big celtic feel and also mixed prog, AOR and Irish folk – this is just so brilliant that I’m almost lost for words! “Peaceful Harbor” is another magnificent ballad. It’s huge, but still very melodic and I hear some Boston influences in the guitar, but the overall sound makes me think of a musical. The album ends just like it started, with a big, epic progressive tune called “Cosmic Symphony” that is split in three parts – “Still Life Of The World”, “Searching For The Air” and “Pound For Pound” and the title explains the song well – a symphony it is. So the answer to my question if Flying Colors would deliver once again is a big YES! If this album is better than their debut, is hard to say, if not impossible. What is clear is that I got the same feeling from listening to this as I did for the debut, only with this one I had some great expectations – expectations that they fulfilled – and then some! I can’t find one single thing to complain about here and everything is just resplendent – the song writing, the production, the performance. Fact is, if I was to decide, I’d make sure the members made Flying Colors their main project because after two magnificent albums, it deserves to be. Flying Colors also deserves to be huge and ship their albums multi-platinum – and I really see no reason for this album not to. It’s progressive enough for the big time prog lover, but still “normal” enough for the hard rocker who just wants to rock out. On top of that, they have a couple of tunes that wouldn’t sound wrong on the radio. Check this out now because I can’t imagine anyone not liking this. Fantastic!